3pc SUPERNATURAL Full/Queen Size COMFORTER & 2 PILLOWCASE Set by Supernatural at UtopyaCon. Hurry! Limited time offer. Offer valid only while supplies last. Join the hunt for a good night's sleep with this 3 Piece Full/Queen Size Comforter set that features a Super Soft double-sided microfiber comforter. Join the hunt for a good night's sleep with this 3 Piece Full/Queen Size Comforter set that features a Super Soft double-sided microfiber comforter. One side features an ominous silhouette design, the other side features an allover symbols print design. 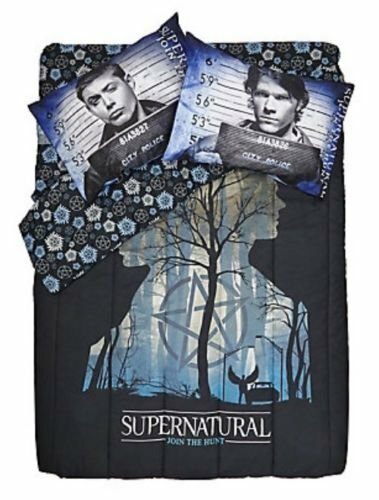 Two Sam and Dean Mugshot Pillowcases are included! If you have any questions about this product by Supernatural, contact us by completing and submitting the form below. If you are looking for a specif part number, please include it with your message.